Ready for a fully charged phone... forever? If you are unsatisfied with your purchase due to product defects, simply send the case back and we’ll refund 100% of your money, no questions asked. We’re confident in making this offer because we believe in our products. We stock only the highest quality cases and accessories from the most reputed iPhone accessory manufacturers. Our customers agree: less than 1% of purchases have ended with a return. Does it work the iPhone 8 ?? It came with zero instructions. I have no idea how to charge the bracelet. I finally got mine in the mail and it does NOT work at all! It does. It charge in any charging port and does not charge my phone. I am very disappointed. Easy to carry around and works great on my phone it's hooked up. 5 stars for sure! Tight bracelet, just got it today after about 2 weeks. Really happy with it. Charges my phone really fast and fits on my wrist like charm. So about a month has gone by since I bought this beaded bracelet for my iPad and I wanted to make sure it worked before I wrote a review and so far still good. It does a great job and it's really convenient. I like the design too and the fact that it's also a bracelet in which you easily wear and carry around with you. Thanks! Purchased 3 of these bracelet chargers - 1 was part of some type of promotional deal. Really happy with these items. My roommates also loved them, thought it was nice roomie gift. Thanks so much! Bought this for my grand daughter and she really loved it. She wears it every day to school. Bought it with the powerbank, really a great combination. Such a great find on Instagram. I really love this bracelet, it's really well made and such a great idea honestly. Won't tangle like typical cables. LOVE IT! Really cute bracelet!!! Fits great and charges my phone fast too! Just arrived and just in time too! It's Friday! The bracelet is amazing! Looks and feels nice and does the job of charging your phone. Thank you Wlthcases! Sweet bracelet! As you can see the bracelet fits me really well. Really cool design and when I plug it in to my powerbank or any outlet it does a super fast job of charging my phone. Really well made. I really love this bracelet. Well made, fits great, and charges my phone incredibly fast. Highly recommend buying this bracelet. Dope bracelet! Charges my phone pretty fast and fits great on my wrist. The bracelet is absolutely cute! Really happy with it! The bracelet is stylish and suits most of my outfits. The charger functionality is a plus however the size of the bracelet on my wrist is way too tight, i wish it was adjustable. Absolutely love this bracelet! It's so cute! Got plenty of compliments from my friends. Not only that it also charges my S8 really fast! Purchased one of these bracelets after I saw their ad on Instagram and once it arrived I was really excited to test it out. It's been about a week and it still works. Fits perfectly around my wrist when I head out and charges my phone great when I need to. Cool bracelet! Really handy when you need it. Amazing charger cable! Don't have to worry about it getting all tangled up. Great bracelet! Really happy with this purchase! Received today after 10 days, really happy to finally have it. At the moment it's working great when it charges my phone and when I'm not using it and fits perfectly on my wrist. Great product. I bought a black and pink bracelet, the pink one was for my sister. We both really liked them. They work great, and fit nice around the wrist. The bracelet works great! Really like the design and feel on my wrist. Would highly recommend and considering to pick up different colors. It works fine, it just doesn’t fit my wrist, it is much too small. Is there a larger one for a man’s wrist? Cool cable! Worth every star. Might pick up some more for xmas gifts. Bought this bracelet for my sister and she absolutely loves it! She charges her phone with it every chance she gets and says it charges quite fast. Sick bracelet! Glad I picked up one of these charging cables. Super convenient to have when you need to charge. Cute bracelet!! Charges phone fast and fits great on the wrists. Such a cool gadget! Pretty cool accessory to have on the fly. Really cool bracelet! Easy to carry and convenient to have. Hard to lose and easy to carry unlike normal cables. For instance, no need to worry about it getting tangled. I love it! It's nice to conveniently carry a charger with you at all times! It is a very cool thing to have. I have it every where I go and it works just fine on iphone 6. This bracelet is clutch! Was at friends place and he had no iphone chargers. I'm like you in this day and age? But he does have an android which explains it. But since I had my bracelet that was no problem. Awesome bracelet! Perfect companion for my power bank. Charges my phone fast and fits my wrist beautifully. Will never have to use a stranger's phone for to get an uber ever again lol. The charger/bracelet was cheaply made and does not match it's description. I want to return it, but no one has ever responded to inquiries. Greetings, bracelet arrived in 2 weeks time. It looks great and works fine! Thank you very much! Honestly I tried only the pink one for I phone 6, it works and it looks also really nice!! The others are all presents! the pink one for I phone 6, it works and it looks also really nice!! Love the bracelet, really hand when you need to charge. Don't have to worry about it getting tangled too! Bracelet looks great and also charges really fast! A great buy. Dope bracelet! Fits well on my wrist, not too tight and not too loose. Also charges great when I hook it up in my car. Might pick up some more. Looks so cute on my wrist!! Not only that it works great too, charging my iphone pretty fast when plugged into the outlet or with my power bank. Worth every star! So cute!!!! Really love my pink bracelet! Works great too! Sick bracelet. Really handy to have. Charges phone very fast. Cable works! Charges my phone super fast when hooked up .Thanks so much! Got this bracelet in the mail today and all I can is I absolutely love how it looks and feels on my wrists. Now for the actual cable, so far so good, it works great my phone. Super handy and charges pretty fast. Bracelet looks and works great! Charges my iphone quite fast. Bracelet arrived today and it is awesome! Can't wait to wear it out tonight. Happy Friday! So made a mistake on my order, accidentally ordered the white instead of the black one. As soon as I realized my mistake few hours later I contacted their support team. Ryan was able to switch the orders for me. Bracelet arrived yesterday, been really satisfied with the product and their customer service. Thanks a lot man. Love it! Works fine too! Thanks so much! This was my worst online shopping experience ever. First of all, this product is advertised as a charger. it is not. 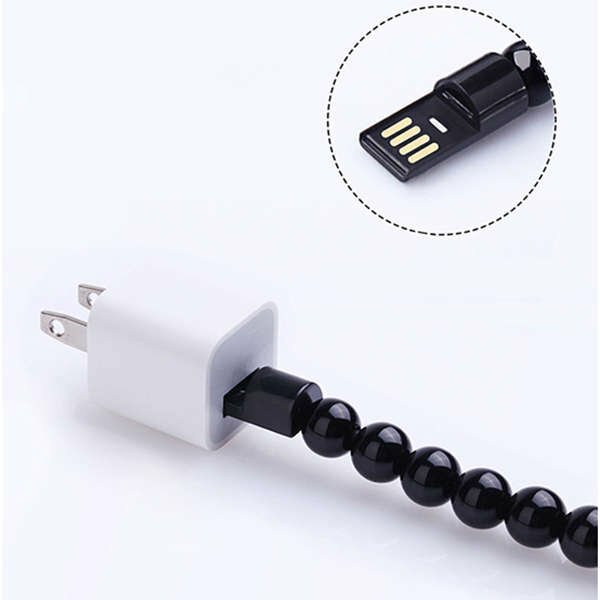 It is a glorified charger CABLE which didn't even fit well on my phone. When I tried to return it, I was told that I couldn't return it unless it was damaged, then I was told I couldn't return it because it was on sale, in spite of the satisfaction or money back guarantee on the web site. They basically stole my money. Do not do business with this company! You will regret it! The bracelet is absolute gorgeous. It feels and looks great on my wrists. For charging, works fine, charges my phone quite fast actually. Cheers! Cool bracelet. Perfect companion with my mophie power bank. Definitely recommend this cable. Bracelet just came in today! Felt like forever with the shipping (2 weeks), but so happy its finally here! Bracelet looks and feels great! Charges my phone pretty good too! Perfect! A bit bigger for my arm but it's all good! Great bracelet and fast shipping! Is very large and ugly. Love this bracelet!!! It's so cute! So happy when this came in the mail today. Shipping was slower than i'd like but just happy to have it! The bracelet works well in my car and charges pretty fast! Great Bracelet! Fits great on my wrist and does the job when needed. Stylish & practical. All you need is just a USB port and charge you go! I absolutely love it! It's nice to conveniently carry a charger with you at all times! Nice concept and design. It charged my phone pretty fast. Worth every star. Basic, cheap, smart, and gets the job done!!! Charges phone and iPad great! Very suitable for working on my PC, because it's short, and saves a ton of space. No problems so far! Perfect thing to have when I was at a bar. Phone was dying and needed to call an uber, luckily had this and my adapter so I was able to charge it. Life save!